Late model modular powered Mustangs are unprecedented for their performance and ease of modification. Nitrous has always been one of the most popular additions to these Mustangs, but enthusiasts often times have had to fight with making universal type kits fit and perform well. Once again, ZEX™ is at the forefront of nitrous technology by developing an innovative wet nitrous system designed specifically for 1999-‘04 Mustang GTs. Every hose, wire and even a custom machined billet fuel rail adapter have been engineered and manufactured for a perfect fit on these Mustangs. 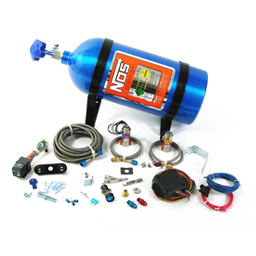 You simply won’t find a better looking, more powerful or easy-to-install nitrous system on the market. In addition to perfect fit and ease of installation, the new ZEX™ 1999-‘04 Mustang GT Nitrous System incorporates the most technically advanced performance features available, including the patented ZEX™ Active Fuel Control™. This innovative performance and safety feature automatically adjusts the nitrous fuel enrichment so your engine never runs too rich or too lean. In addition, the ZEX™ nitrous system features a patented electronic TPS switch for perfect system activation at wide-open throttle. Power settings are fully adjustable from 75 to 175 horsepower with the included tuning jets. 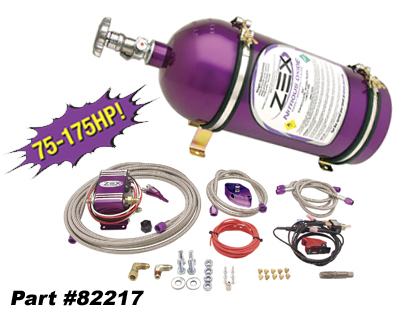 For more information about the ZEX™ 1999-‘04 Mustang GT Nitrous System or any other ZEX™ product, call us at 1-888-817-1008.